Build on What You Know The Romans worshiped many gods. In contrast, the Jews worshiped one God and tried to obey God's law. The first Christians also obeyed the law of Moses. ESSENTIAL QUESTION What did Jesus' disciples do after his death? Jesus' first disciples were Jews. Eventually, they developed beliefs and practices that would cause a break from Judaism and became known as Christians. The disciples thought that Jesus had fulfilled Jewish prophecies about the Messiah. The disciples tried to convince other Jews to accept Jesus as the Messiah. The early church stressed sharing property as well as practicing charity, helping prisoners, and taking common meals. Women and slaves were eager to join, perhaps because the new church taught that all its members were equal. These beliefs helped to set the early church apart from other religions of the time. The disciples hoped to spread Jesus' message and convert others to their beliefs. 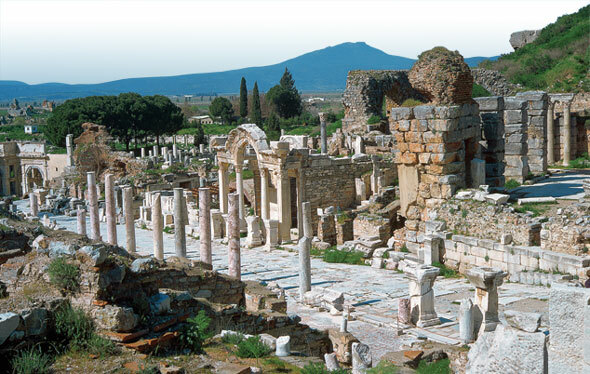 Ephesus - This view shows the ruins of a street and temple in the Roman city of Ephesus in Anatolia, where early Christians preached. The first members of Christian churches were Jewish converts to Christianity. The conversion of Gentiles (JEHN•TYLZ), or non-Jews, to Christianity sparked a debate. Some thought Gentiles should observe the Torah, while others thought that this was unnecessary. At first, Roman leaders ignored the early Christians. Like the Christians themselves, the Romans viewed Christianity as a sect, or division, of Judaism. Jewish leaders disagreed with this view. ESSENTIAL QUESTION What change did Saul undergo? One of the men who became an early leader of the Christian church was Saul, who had been born a Jew. Later he wrote about how his faith changed and how, as a young man, he had actively opposed the Christian church. While on the road to Damascus, Saul experienced a sudden conversion. According to his own account, Saul felt that God had revealed Jesus as His son to him, and appointed him to proclaim Jesus among the Gentiles. Saul came to believe that Jesus was the Jewish Messiah. When Saul reached Damascus, he sought out members of the church and joined them. There he studied his new faith and began to convert Gentiles. Saul's cultural and political background helped him convert a variety of nonbelievers. As a Pharisee, Saul knew Jewish law. He had been born in Tarsus, a city in Asia Minor heavily influenced by Greek culture. By birth, Saul held Roman citizenship. This allowed him to travel freely through the empire. When he traveled, Saul used his Roman name, Paul. After three years according to Christian scriptures, Paul was ready to travel as a missionary, or person who spreads his faith by converting others to his religion. ESSENTIAL QUESTION Where did Paul travel, and why? During Paul's lifetime, the Roman Empire was experiencing the Pax Romana, or "Roman peace." That made the empire's excellent roads safer for Paul's widespread travels. Nonetheless, Paul's travels weren't easy. He made four missionary journeys. Each one took several years. Paul wrote that he faced "dangers from rivers, dangers from bandits, . . .dangers in the wilderness, dangers at sea." Paul and other Christian missionaries brought about changes that made it possible for Christianity to spread throughout the Roman Empire. For years, Paul and other early Christian leaders struggled over whether Gentiles had to become Jews before becoming Christians. Paul argued that conversion to Judaism was unnecessary. Paul's idea helped separate Christianity from Judaism. It also made the new religion more appealing to Gentiles. As a result, Christianity began to spread throughout the empire. Paul - The apostle Paul was the most important early Christian missionary. Almost everywhere Paul went, he started new churches. He kept in touch with these churches by writing letters, delivered by other missionaries. Paul's letters explained Christian beliefs and urged converts to live according to God's laws. He preached that salvation was available to all people if they accepted Jesus. Paul's letters became an important part of the New Testament. They are among the Epistles ("letters"). In one famous Epistle, Paul wrote that believing in Jesus broke down all barriers between people: "There is neither Jew nor Greek, there is neither slave nor free, there is neither male nor female; for you are all one in Christ Jesus." Paul had wanted to travel to Rome to speak before the emperor and spread his Christian faith. He did reach Rome, but not in the way he had hoped. Near the end of his career, Paul returned to Jerusalem. He was taken into custody by the Romans when it was rumored that he had brought Gentiles into the Temple. After staying in prison for two years, Paul demanded to be tried before Caesar in Rome. According to some who endeavor to reconstruct the history of early Christianity, Paul left on his final journey in late autumn A.D. 59. After arriving in Rome in early A.D. 60, Paul remained under house arrest for two years. He wrote several letters from captivity. Then, he suddenly stopped. Paul probably died in Rome, possibly after being persecuted — that is, opposed or harassed —by the Emperor Nero. 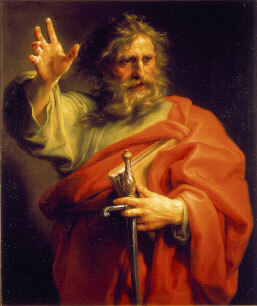 Paul was the most influential of the early apostles, or messengers of Jesus, because of his many journeys and letters. He helped spread the church from Jesus' homeland out to the nations of the world. Relief Sculpture - This Roman sailing ship of the first century A.D. was the kind of ship in which Paul would have made many of his journeys. Jesus' disciples tried to persuade other Jews and debated whether to seek Gentile converts. Saul became the most important early Christian missionary. Paul's conversion of Gentiles established Christianity as a new faith. More than any other person, Paul contributed to the growth of Christianity as a worldwide religion. All over the world, many churches and cities are named in his honor.